Founded in 2004 by the former SHEPHERD members Oliver Bojoski (guitar) and Tobias Engl (drums), ANDROID EMPIRE’s musical heritage lies in the vibrant doom and stoner scene of the early 2000s. Throughout the first two years of the band’s existence, various musicians entered and left the picture until, in late 2006, guitarist Martin Fischer joined the project, followed in mid-2007 by Dutch bass player Detmar Heß and Chilean vocalist Jaime Correa. The first, self-titled EP that was released in early 2008 clearly showed that the band is well able to move beyond genre limits: Presenting a gritty and powerful mix of sludge and stoner rock, the EP did not only bring the band numerous enthusiastic reviews but also support shows for bands like BARONESS and KYLESA. Shortly after the band and Jaime Correa had decided to go separate ways, ANDROID EMPIRE received an offer to open for PELICAN in fall 2008. Confident that their music would convince the audience even without vocals, the band decided to play their first instrumental show – and received very positive feedback. Of course, the resulting question was: Why not continuing without vocals? Said and done, the band started writing material surpassing the old songs in complexity and diversity. After further shows with bands such as SAINT VITUS and BURNT BY THE SUN, the band released their second EP “The Old Bordello on the Hill of Sold Souls” in June 2010. Incorporating both progressive and classic metal elements, “The Old Bordello …” set the course for ANDROID EMPIRE’s further development. After the band had finished songwriting for their first full-length, things came to a halt in mid-2013 when drummer and founding member Tobias Engl quit to focus on his bands DROWNED and ESSENZ. Left in limbo, the remaining band members continued rehearsing, but the search for someone to fill the gap eventually covered a period of 18 months. Meanwhile, guitarist Martin Fischer also joined Berlin’s instrumental stoner rock veterans ROTOR. Enter James Schmidt (JUD, THE FULLBLISS). A long-time friend of the band and an accomplished drummer, the native Londoner joined ANDROID EMPIRE in spring 2015 and immediately turned out to be the right one for the job. 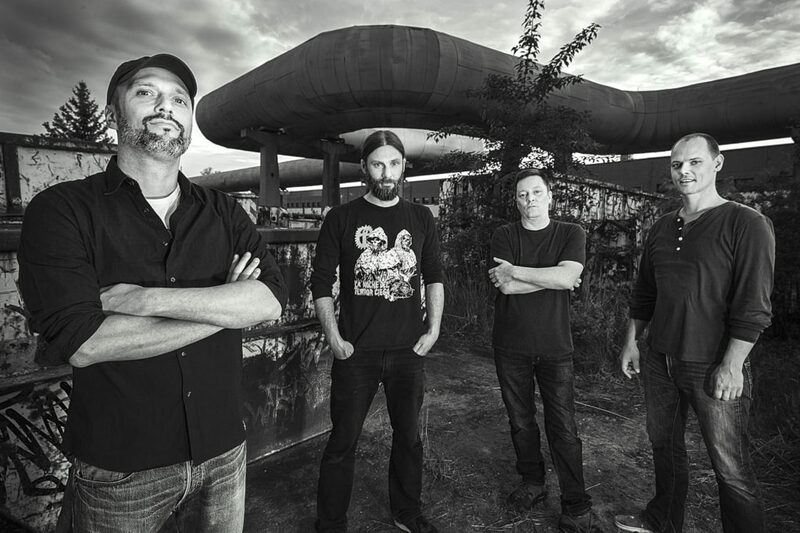 Several months and shows later, the band was finally ready to tackle their first full-length album “Monument” in June 2016. Recorded, mixed, and mastered at Berlin’s one-and-only Studio Wong, “Monument” is a 60-minute ode to the riff merging ANDROID EMPIRE’s sludge roots with progressive, classic metal, and post-rock elements – a trip into a world of all-instrumental heaviness. The double vinyl album will be released in September 2017 via Arctic Rodeo Recordings.